If you’ve been injured before, you know that one of the first things that can happen when you walk into a doctor’s office is that a bunch of tests get ordered, right? Sometimes they seem relevant to your injury, and sometimes they don’t. They all cost money. Some of them give immediate results, and some of them you have to wait for a week before you hear back. All that to say that things can be very confusing, overwhelming, and expensive. At Georgia Spine and Orthopedics, we want you to know the why behind the what of your treatment. Each of our doctors and therapists believes strongly in education and in empowering you to be in charge of your recovery. We always want you to ask your questions and know the reason behind our recommendations! In this blog post, we are discussing a common question about the difference between MRIs and X-rays. What kind of information do doctors gather from each test, and how do they know which test is needed? Let’s dive in. 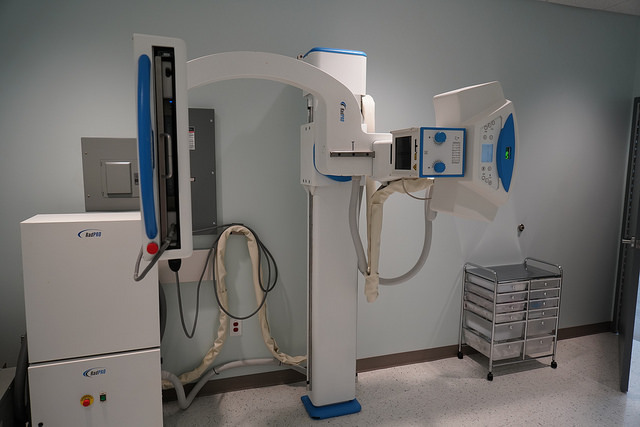 What: An X-ray is the go-to tool for helping determine structural, aka, skeletal, issues. How: Using electromagnetic waves to capture an image of the body part in question, an X-ray provides a quick view of the inside of the body. It allows the provider to see most fractures, whether or not joints are in proper alignment and appreciate the spaces between the bones. The electromagnetic waves generated by the X-ray machine pass through organs and soft tissues but are blocked by dense objects such as bones, medical devices such as shunts or implants, of foreign objects such as a coin in a child’s stomach or a piece of embedded shrapnel, causing them to show up in white on the X-ray film. Why: X-rays are quick and (comparatively) inexpensive, making an X-ray a good choice for getting an initial internal assessment of an injury/pain source. What: An MRI, on the other hand, doesn’t use electromagnetic waves. Instead, a strong magnetic field and advanced computer imaging allow for the capture of highly detailed images of bones, muscles, organs, and even tissues and blood vessels. How: An MRI usually takes between 30 minutes and an hour to complete. The test results then get sent to the radiologist, who is trained to read and interpret the data and images collected, which is why it often takes up to a week to get results and implications back from the test. Why: MRIs can help doctors identify subtle differences between healthy and unhealthy tissues and locate issues such as torn cartilage or ligaments, or herniated disks. The time and equipment involved make MRIs more expensive than X-rays, but they provide an extensive array of information to assist with accurately diagnosing and treating your injury! In the medical world, there are many different testing options, and at Georgia Spine and Orthopedics, we want you to feel informed and confident about why we are doing what we are doing. We hope this brief overview of these two common tests gives you some clarity, but we’d love for you to comment with your questions or give us a call to ask more about your treatment options after an accident!